How do you know who you can include in your inner circle of confidants at work and in your personal life? Ever been burned by making the wrong choices? It's not an easy question to answer, yet it couldn't be more important to try. As scholar Dr. Linda Stroh argues, trust is a prerequisite for effective management, and it contributes directly to our work and personal success. 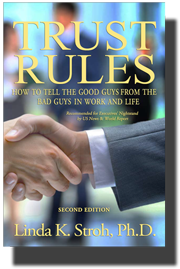 To find out how to tell the "good guys" from the "bad guys," Stroh interviewed many CEOs of multinational companies and hundreds of others. From these hundreds of interviews, Stroh crafted a "Trust Rules Questionnaire" that we can use to make better decisions about who to let into our inner circle of confidants at work and in our personal lives. The book is an invaluable compendium of lively stories, lessons learned in the trenches, and practical tools and principles. Readers will learn how to identify the trustworthy at work and in their personal lives--giving their careers a boost and helping them sleep better at night. That's because having trustworthy people around us makes organizational and personal life much easier and less stressful. Yet, since ancient times, people have pondered the issue of trust. How do we decide who to let into our inner circle? To what degree do trusting relationships impact our performance at work? What are the consequences of misplaced trust? Must trust be unconditional? Taking these questions out of the realm of the philosophers, Professor Stroh draws from her extensive research to highlight common themes and the hard-won lessons learned from experience. She then distills their thoughts and experiences into practical tools and techniques for assessing trustworthiness--including your own--and applying these tools in a variety of situations. Integrating insights from management, practical experience and psychology, Dr. Stroh shows readers how to pay attention to red flags in relationships and ultimately develop a network of trustworthy people that will help them succeed in business and beyond. Among other things, the book covers: *The devastation that results when we trust too much; *Why we need to "mistrust" as well as trust; *When to use the book's checklist for assessing a person's trustworthiness; *How to work with people we know are untrustworthy; *Who deserves unconditional trust; *When to give someone a second chance; *How to be sure that you yourself are trustworthy. The new edition to the book tells us how to better manage our emotions, how to build trustworthy families, the negative health effects of lying and how to deal with trust in the digital age.